On returning to Paris, the elderly Andre Sloga is brutally beaten in the underground car park beneath his apartment building and left for dead. When private detective Gabriel Lecouvreur reads about the story in the newspaper the following morning he feels compelled to find out more. Sloga had been a gifted but controversial writer who had drifted into obscurity as his books dropped out of print. With Sloga clinging to life in hospital Lecouvreur tries to retrace his recent life to look for clues as to the perpetrators. He discovers that Sloga was nearing completion of a new book, one that exposes a sordid and dangerous political underworld, and he sets out to determine who exactly attacked Sloga and to complete his work. Didier Daeninckx has a reputation for being one of France’s most controversial crime fiction writers. 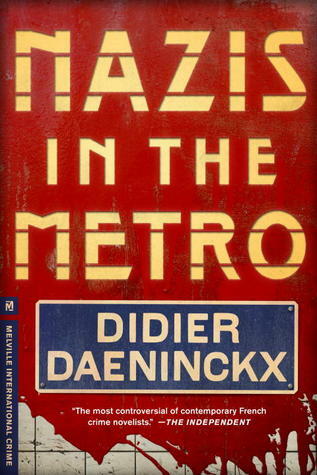 Nazis in the Metro is a relatively short tale (178 pages) that has a fairly linear plot which seems to more a vehicle for revealing the sordid political underbelly of modern France than performing a crime tale. Although quite nicely told, my sense was that the plot was weak and truncated throughout and in particular fell apart somewhat at the end. As such, while the substance was interesting and the character of Gabriel Lecouvreur appealing, the tale fell short of expectation and was ultimately a little disappointing. This was a shame as Daeninckx clearly has something interesting and worthwhile to say about French society and its politics. Yep, I also find him very hit and miss. Usually great on the big issues, society, history and so on, but usually not so great on character. 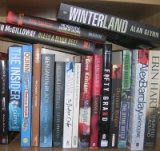 Plotwise I found his "Murder in Memoriam" a far better novel, with a more twisting and satisfying storyline, though I couldn't stand his Detective Cadin character: he's glib, smart-arsed and even chats up a murder victim’s girlfriend (as you do). I really liked Murder in Memoriam, and it's not many writers who have inspired a change in the law - although Cadin is just a bit of a Gene Hunt-esque cardboard-cutout. The big question Rob: How many times did you double-check your spelling of his name? He's written so much, including for children, that it's inevitable that some of it becomes a little formulaic. But I do like his political engagement and candour. I recommend Le der des ders - a BD (illustrated by Tardi) about the aftermath of the First World War. Murder in Memoriam is the book I went into the store to buy - and I still aim to give it a go - but they only had this one so I thought I'd give it a try. The guy can write, but this story was underdeveloped. I didn't double-check his name, just copied it out so thankfully I didn't get it wrong!